Reading and share top 2 famous quotes and sayings about Ouzo by famous authors and people. Browse top 2 famous quotes and sayings about Ouzo by most favorite authors. 1. 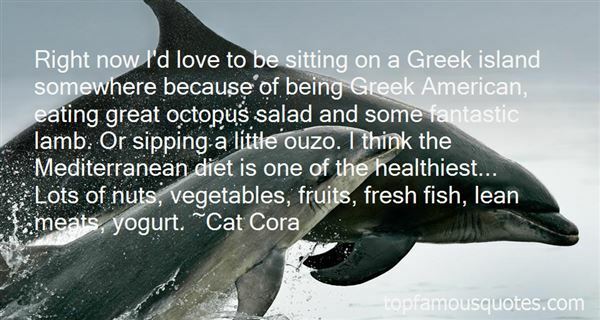 "Right now I'd love to be sitting on a Greek island somewhere because of being Greek American, eating great octopus salad and some fantastic lamb. Or sipping a little ouzo. I think the Mediterranean diet is one of the healthiest... Lots of nuts, vegetables, fruits, fresh fish, lean meats, yogurt." 2. "I will not be quiet. I cannot believe you're moving to Greece. That's… that's insane. "Now hang on a second! "It's not insane," I shot back. "It is! Who moves to Greece? Do you know a single soul who's moved to Greece?" He didn't give me a chance to reply before he continued, "No? Me neither. No one moves to Greece. Goes there. Yes. Gets laid. Definitely. Drinks ouzo. Lots of it. Gets a sunburn. Of course! 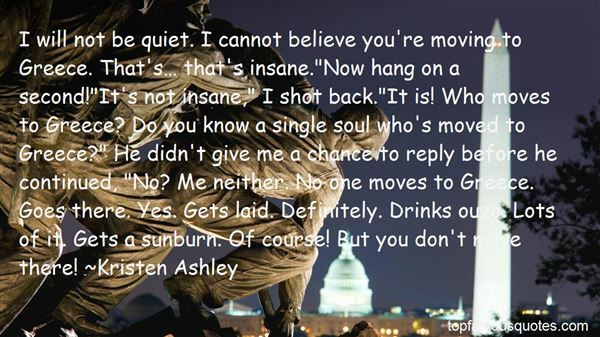 But you don't move there!" …though queens are a particular obsession of mine. I'm not speaking of European sovereigns, mind you, but that most glorious force of the chessboard. Did you know her square was originally occupied by a male "vizier," able to advance only one meager diagonal step per move? But during the reign of the great female monarchs, this piece metamorphosed into a "queen," and her power grew commensurate with her title. Only then did the game become something more— A mental odyssey that helped reshape the world."